In case you were wondering what would become of the newly empty curb space at Market and 10th Streets, where the traffic lane stripings were re-configured over the weekend, it turns out the SFMTA plans to put a bike-share station there. “With Bay Area Bike Share set to launch this August, the SFMTA saw an opening to initiate striping changes that would better utilize space on this segment of Market St., and provided room for an upcoming bike sharing station on the south side of Market St, just east of 10th St.,” SFMTA spokesperson Paul Rose wrote in an email. Great spot for a bike share station! There is no doubt that car drivers need more discouragement than paint provides to not invade other users domain. Ok, how many folks out there were assuming that space was for Uber cabs for the Twitter building? Now Twitter employees will have another way to avoid the #hastagexpress! Anyone else outraged that the City is so easily letting a private company take public space to park their corporate bicycles, while shortchanging the public on secure bicycle parking? The space is not for twitter bicycles. 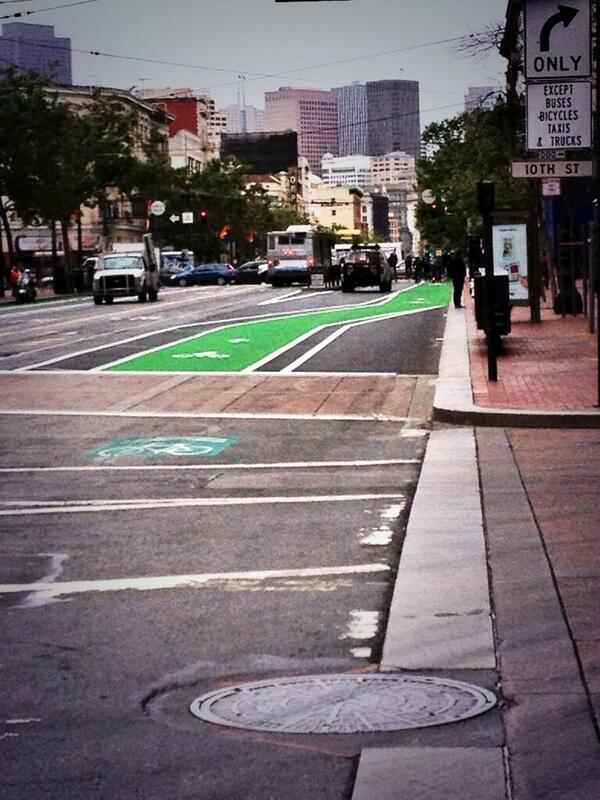 It is for the Bay Area Air Quality Management District and SFMTA Bike Share program. Last I checked, those are both government agencies. But that public space should be used to park my private car for FREE! Those little bumpers from Budapest look like they would work on JFK Drive in GG Park. The BikeShare contract is with a private corporation. I am aware that the parking spaces are not intended for twits. That bike lane looks super unsafe. It’s *entirely* in a door zone, with no where to swerve to. Yeah, seems odd they didn’t add another foot or two. But in their defense, their cars are smaller and therefore the car doors as well. The drivers/passengers also are taught to look before swinging their doors open.